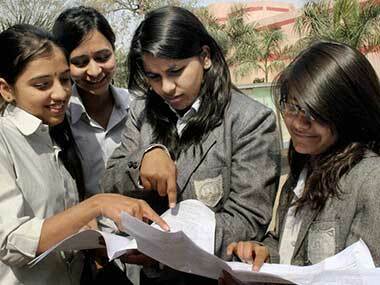 The CBSE results were announced on Sunday, with the topper scoring 99.6 percent. According to The Indian Express, there has been an increase of 7.3 percent in the number of students scoring 95 percent and above — from 9,351 last year to 10,091 this year. Furthermore, a perfect 100 has been achieved by a few students in almost all schools this year. This has caused considerable concern for students seeking admission, with cut-offs expected to soar coupled with competition from other boards in securing admission. Could the marks moderation policy be the reason for the soaring cut-offs? News 18, in a report, said that CBSE has announced the results retaining the marks moderation policy, in accordance with the Delhi High Court ruling. Moderation policy is a practice where "students are given extra marks in subjects regarded as difficult, or when there have been differences in the sets of question papers." According to The Indian Express, in 2015 to 2016, cut-offs rose by 0.5 percent to one percent across various streams. However, the News 18 report hinted that cut-offs may decline if the moderation policy was scrapped: "Sources at the DU admission department said that there were chances of the cut-offs seeing a dip this year if the school boards had gone ahead with scrapping the moderation policy." However, Hindustan Times reported that only marginal rise in cut-offs would be noted. In Delhi, the number of students securing 95 percent and above has decreased — from last year’s 2,927 to 2,326. But the decrease would not translate into lower of cut-offs at the Delhi University since the university accept applications from all regions in India. The results may cause worry among Delhi students as they might find it difficult to get into a college of their choice.